Warning :the method presented in this article are too old to be applied now ( maybe work on Mate ? ) . Use this information at your own risk. I hacked this morning the thumbnailer distribued with the openraster librarie to work with the Krita native *.kra files. I tested this on Linux Mint 9 and 10 ( so I presume it will works on Ubuntu Lucid and Maverick ). Btw, I don't know how the new Ubuntu 11.04 would handle it ( please use comments if you tested it with a success ). I redistribute it under the GNU GPL license V3 ( file inside ), same as the original libora thumbnailer. Grab this kra-thumbnailer-gnome. zip files (13Kb) , decompress it on your system , run a terminal and move to the uncompressed folder. The code lines to copy/paste are in the 'install' file. that's it ! 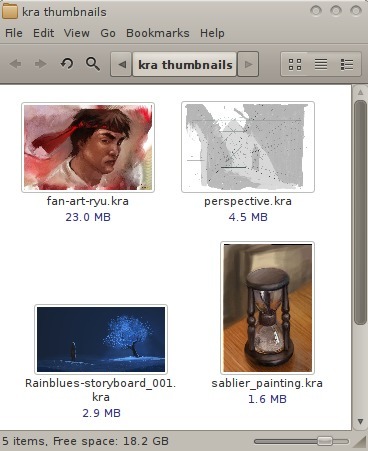 Enjoy new *.kra thumbnails. Note: thanks the Krita dev CyrilleB for the thumbnails improvement he made in few minute on IRC(freenode) #krita channel. Before his commit, the thumbnails were dithered. So, if you have *.kra file dithered or not good looking thumbnail, don't report it : it's fixed. If you compile it from GIT master, just update and compile , open your old *.kra file and save them over : you should have the pretty thumbnail now. License: CC-BY David Revoy, www.davidrevoy.com, 1 july 2011 .
unfortunately, it does not work on my computer, using ubuntu 11.10. @Daniel R : That's why I wrote for "Linux Mint 9" ( gnome 2 based ). on 11.10 all is Gnome 3 based for the filemanager, so certainly needs other tweakings. I 'll not develop it as I'm not interrested yet by Unity/classicmode/Gnome3 desktop. You can get the thumbnail working on Dolphin with Kubuntu or all KDE desktop ( activate 'calligra thumbnail' after a Calligra install ). This still works in Ubuntu 12.04, with a few minor changes. @David This also works on Ubuntu 14.04, with @Ragnars way. @raghukamath : Cool :) A new thumbnailer is also available here : https://github.com/Deevad/gnome-kra-ora-thumbnailer , and works with Nautilus, Nemo (recent version).